Backou gains strength. He eats a lot of roots, fish, honey, red berries and he swims in the forest’s river. But his mother has become fatter. She often stays near the cave and she gets tired quickly. Backou and Canelle do not venture away from the cave. -Why is mother always more tired? Backou asks his sister. –Is she sick? -No. Do not worry, mother is fine. If she gets tired it is because we will have a little brother or sister soon explains Canelle. -Oh yes! There will be even more of us! We will need even more fish, more fruit and honey, says Backou. -We will help Papa and we will also help our little brother and sister. We can have fun with them and teach them how to get bigger, says Canelle happily. Just then Mamma Bear calls Canelle. That’s it. Your brother and sister have arrived. Look after your brother and both of you prepare a place so my babies are warm. Canelle and Backou go and gather some moss and return quickly to welcome the bear cubs. -Hooray! It is a male and female. What will we call them? Asks Canelle. 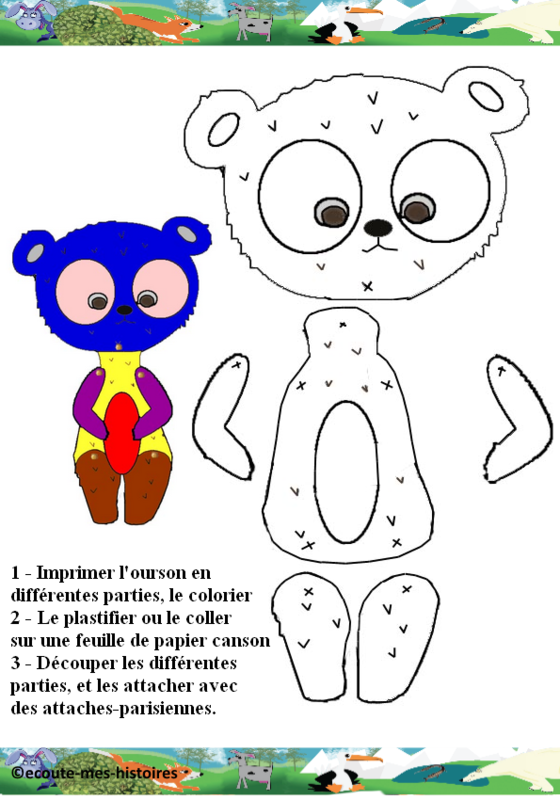 Print the different parts of the bear and colour them in. Laminate or glue them on a sheet of drawing paper. Cut the different parts and attach them with brads. Relaxation: Let’s watch the 2 little bear cubs.